For storage of up to 20 e-mail or website addresses. 2 button cells incl. AM/FM radio with alarm function and date. 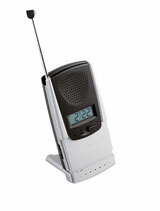 Alarm with radio or buzzer, sleep timer and earphone jack. 2 UM4 and 1 button cell incl. FM radio. The volume can be adjusted by pulling the handle. 3 UM3 incl. 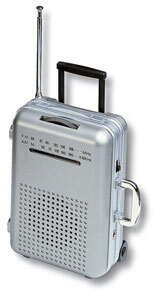 AM/FM radio with calendar, world time clock with 24 counties stored in all time zones. Alarm function with radio or buzzer, snooze control. 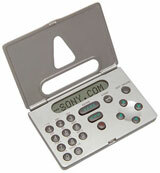 Currency calculator with a function to store conversation rates and a databank for 36 names and telephone numbers. 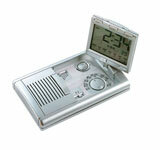 AM/FM radio, alarm function with radio or buzzer, snooze control, 12/24 hour clock, stopwatch, earphone jack and backlight. 3 UM4 incl.